iGAAUGE is a roadside companion giving drivers access to troubleshooting and car repair information, nearby fuel and traffic information, preventive maintenance and service schedules, and special offers from AAMCO that are only available to iGAAUGE users. Whether you are on the road or at home, expert automotive help and service advice are available to you 24/7. Need to find out why your check engine light is on? iGAAUGE can help you. 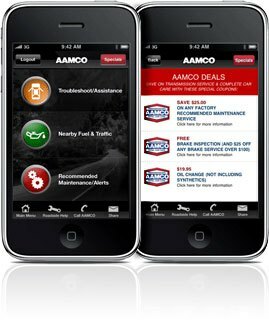 Need to find the distance to the nearest gas station or AAMCO service center? iGAAUGE can assist you. Need to speak with an expert technician? iGAAUGE can connect you. iGAAUGE stands ready to help you with your total car care needs anytime and anywhere within the United States.